Aomori Apple TS Introduction Committee operates this site. The purpose of the site is to offer a learning opportunity to all about apples and to guide consumers to a better way of tasting apples. We aim to deliver safe apples to our valued customers. 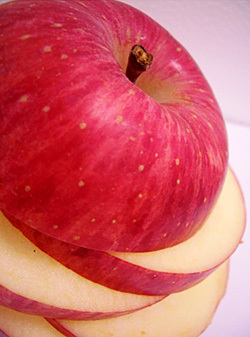 We are dedicated to providing information regarding apples, including traceability. Information posted by the Aomori Apples TS Introduction Committee and users belongs to the author. Unauthorized posting is prohibited. Please contact us to obtain permission to print anything. We are not obliged to compensate for damages caused by the information given by this site and/or linked sites. When a user of this site causes damage to a third person using the information on this site, the user will promise to compensate for the loss. [Aomori Apple TS Introduction Committee] was established to ensure food safety through the implementation of traceability of all fruit and vegetables, particularly apples, for the protection of consumers. The committee consists of five organizations; Hirosaki Chuo Seika Inc., Tsugaru Ringo Market Inc., Hiroka Ringo Liaison Committee, Tsugaru Ringo Market Liaison Committee and Hiroka Research and Development Inc. as Secretariat.